All the Boats on the Ocean: How Government Subsidies Created overfishing, 1945-1976, University of Chicago Press, 2017. 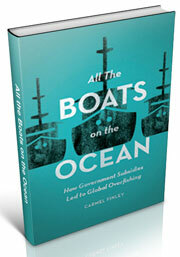 This book is a well-written, scholarly, and engaging history of state subsidies for the fishing industry. 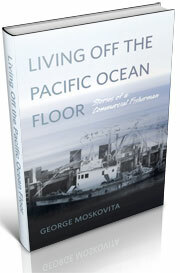 This carefully researched book explores the political and economic philosophies behind the subsidies that gave rise the development of those Soviet and Japanese fishing fleets that hit both coasts of the U.S. like a tsunami in the 1960’s, then mushroomed the size of U.S. “domestic” fleets in the 1970’s and 1980’s. As Finley shows, fishing subsidies are never just about fishermen or food. They are just one component in a suite of tactics used to achieve broader (often covert) national economic and political goals. “Feeding the people” is usually a secondary goal. The expansion of the Japanese fishing fleet after WWII was encouraged and abetted by the U.S. to help rebuild the Japanese economy and keep Japan out of the communist sphere. The Soviets expanded their fleet to show the world the superiority of communist industrial might as much as to feed their people. The U.S. stance on “Freedom of the Seas” was more about freedom of U.S. naval operations than rights for U.S. tuna fishermen to fish as close as three miles from any nation’s coast. Finley argues that the goal of achieving MSY (maximum sustainable yield) throughout the world’s oceans was happily endorsed by diplomats who probably didn’t even understand the conceptual framework behind it. It simply buttressed their position on freedom of the seas. When the international community began to adopt 200-mile fishing zones in 1976, and MSY had achieved the status of a moral imperative in order to avoid “wasting “ fish needed by humanity, the U.S. had a new problem. It could either subsidize the expansion of its domestic fleet and harvest MSY itself, or allow foreign fleets within their new 200-mile limit. They chose the latter of course, and the dynamics of pork barrel politics insured that the domestic fleet soon became much larger than necessary. So what was the result of all these subsidy programs? Since nobody had a clear idea of just what level of harvest might be sustainable, Japanese and Soviet distant water fishing was nothing less than a raid on global fish stocks. They quickly depleted many stocks around the world, resulting in far too many boats chasing far too few fish. The U.S. overbuilt its own fleet and depleted the stocks off the U.S. coast even further. 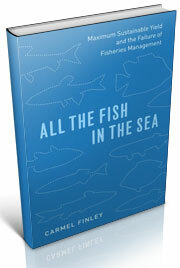 Finley gives a broad overview of global issues, and focuses on the Pacific coast of the U.S. to show how this played out at a personal level for the fishermen, processors, and scientists there. She highlights the fate of Pacific coast “rosefish” (Pacific ocean perch) stocks, which have yet to rebuild from the overfishing that resulted. While the book represents a thorough analysis of fisheries policies through the 1980’s, it leaves out many subsequent developments, and closes with a fairly dark assessment of the current situation. Finley suggests that more marine protected areas need to be established, and that larger spawning stocks of older females must be maintained if fisheries are to be truly sustainable. She may be correct here, but fails to recognize that there has already been considerable progress in achieving sustainable fisheries. Overfishing on both coasts of the U.S. eventually led to the development of laws and management systems (surveys, stock assessment programs, observer programs etc.) that began the rebuilding process, and many U.S. stocks are currently being harvested at MSY levels. “Rosefish” (Pacific ocean perch) stocks have been successfully rebuilt in Alaska. Beginning in the 1990’s, the overcapacity of many U.S. fleets was reduced through buyback programs (requiring further subsidies) and “catch sharing” programs that allocate each year’s fishing quota among the vessels that remain in the fishery. Lee van der Voo’s 2016 book “The Fish Market: Inside the Big-Money Battle for the Ocean and your Dinner” describes the outcomes of several of these catch sharing programs, and serves as a good companion to Finley’s. Suffice it to say that most catch sharing programs have resulted in fisheries that are more sustainable and profitable, although participants with access to capital end up with the lions share of the benefits while many others are forced out of the business as collateral damage. I strongly recommend that anyone interested in the history, science, or management of marine fisheries read both of these books. Finley’s book represents a definitive analysis of the politics of world fishing from the 1940’s through the 1980’s, with the sharpest focus on the Pacific Ocean. Van der Voo’s book explores the outcomes of several catch sharing programs that have been carried out globally since then, with a focus on the United States. Both make for fascinating reading. This entry was posted in Carmel Finley, Cold War, Fisherie subsidies, Fisheries policy, fisheries science, Fishing, History of Science, Maximum Sustained Yield (MSY), Ocean fishing, Overfishing, Pacific Fishing History Project, Soviet environmental history and tagged Subsidies. Bookmark the permalink.